I love bread, especially French baguettes. There is nothing better than walking into a Parisian bakery right after the baguettes come out of the oven (either early, early in the morning or a few hours before dinner time) and carrying home a still-warm baton, nibbling off the extra-crispy end. The crackly crust gives way to steaming, soft insides that are fluffy with small air pockets. And the flavor is just so unique–a taste not found in any other bread. So, when I took a bread cooking class that produced a baguette that was unexpectedly similar to the Parisian loaves of my dreams, I knew that warm baguettes would be popping out of my oven and into my mouth with regularity. I put all of the bread I baked in the class into my purse, and met David and Stella on my way home. Stella was as excited about the baguette as I was, and when I was foolish enough to carry my purse in my hand, she locked on to the exposed end of the baguette and had herself a nice treat. 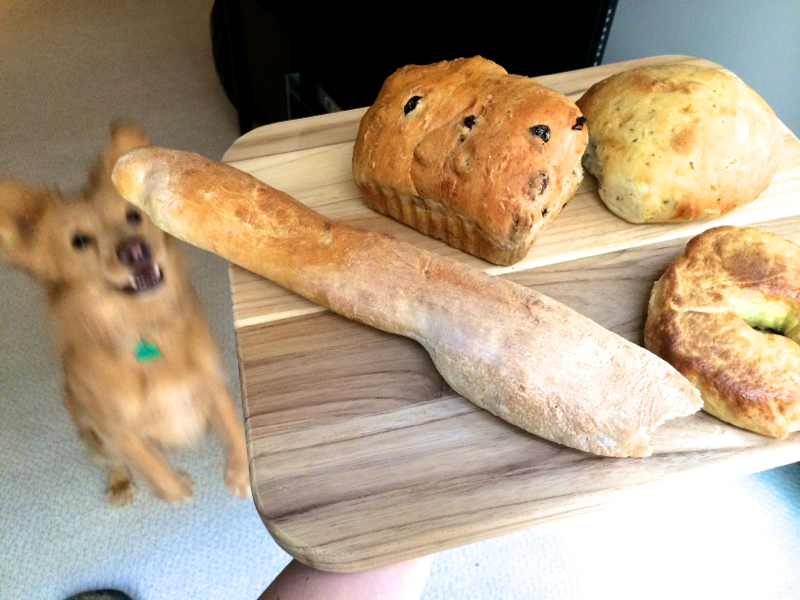 She attempted a repeat performance when I was taking a picture of my bread bounty, but I foiled her attempt with a panicked screech. But don’t worry about little Stella- she can lick up my many crumbs. Making baguettes at home is a two-day affair. One portion of the dough needs to be prepared a day before the rest of the dough, which contributes to the baguette’s fabulous flavor. 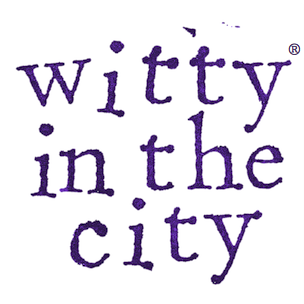 To begin, add 1/2 teaspoon of active-dry yeast to 6 ounces of warm water, and set it aside. To the bowl of a stand mixer, add 5 ounces of all-purpose flour, 5 ounces of bread flour, and 1/2 teaspoon of salt. Mix the ingredients using the paddle attachment, and then mix in the water and yeast. 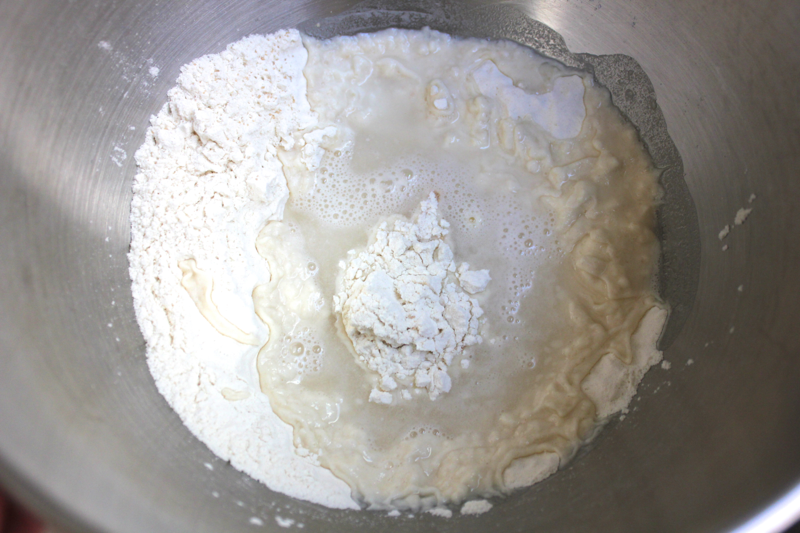 Mix well to form a wet dough, adding additional tablespoons of water if it doesn’t seem wet enough. 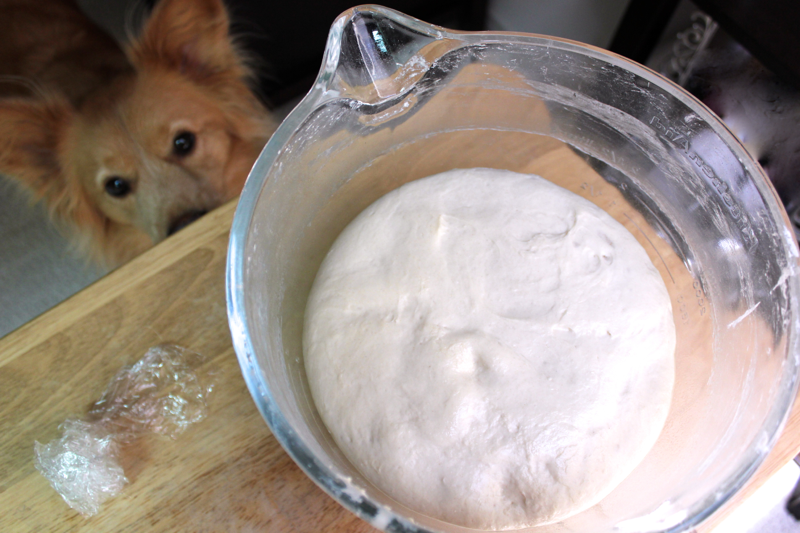 Mix the dough for 4 minutes, or more if you’re kneading by hand. Remove the dough from the bowl, grease the bowl, and then return the dough. Cover the bowl with plastic wrap, and let the dough rise in a warm place until it doubles in size. I like proofing dough in the oven– my last oven could be set to 100º F for this purpose, but my new oven is more limited. Instead, I turned the oven on, and as soon as it starts to heat up and registers 101º F, I turn it off and put the dough in. Once the dough has risen, pull it away from the sides of the bowl to deflate it. Cover the bowl with plastic wrap again, and put the dough in the refrigerator overnight to ferment. Remove the dough from the refrigerator about 1 hour before you want to proceed with the rest of the baguette recipe so that it can come to room temperature. Add 1 teaspoon of active-dry yeast to 6 ounces of warm water, and set it aside. To the bowl of a stand mixer, add 5 ounces of all-purpose flour, 5 ounces of bread flour, 1 teaspoon of salt, and the room-temperature dough you made the day before. Mix the ingredients in the bowl with the paddle attachment, and with the mixer running, pour in the water and yeast. Continue mixing the dough for 6 minutes, or for 10 minutes if kneading by hand. The dough should be sticky but not gooey- add tablespoons of water if the dough is too dry. Once the dough is mixed, you could divide it in half and freeze one portion to bake at another time. This whole recipe makes four 2-foot-long baguettes (baguettes tend to go stale quickly, and should never go to waste!). Remove the dough you want to bake from the bowl, grease the bowl, and return the dough. Cover the bowl with plastic wrap, and allow the dough to rise until it doubles in size. Stella knew that more baguettes were on the horizon. Once doubled, divide the dough into even pieces (4 if baking all of the dough, 2 if baking half of the dough). Don’t knead the dough any more because you want it to retain its air pockets. Put a piece of parchment paper on a baking sheet. Lightly flour a surface and your hands, and gently roll the divided dough into baguette-shaped logs that are the length of your baking sheet. Transfer the baguettes to the baking sheet, and let them rise at room temperature until they puff up a little more. 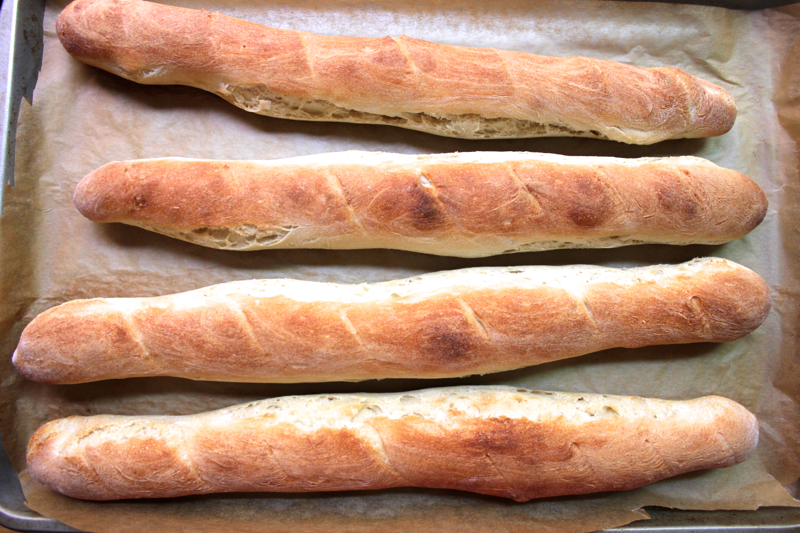 While the baguettes puff, heat your oven to 500º F. Once puffed, score the baguettes with a sharp knife. Make your cuts about 1/4 inch deep or else they might disappear like mine did. Put the baking sheet into the oven, and lightly mist the baguettes with water from a spray bottle. Close the door, wait 30 seconds, and then repeat the misting process 2 more times. 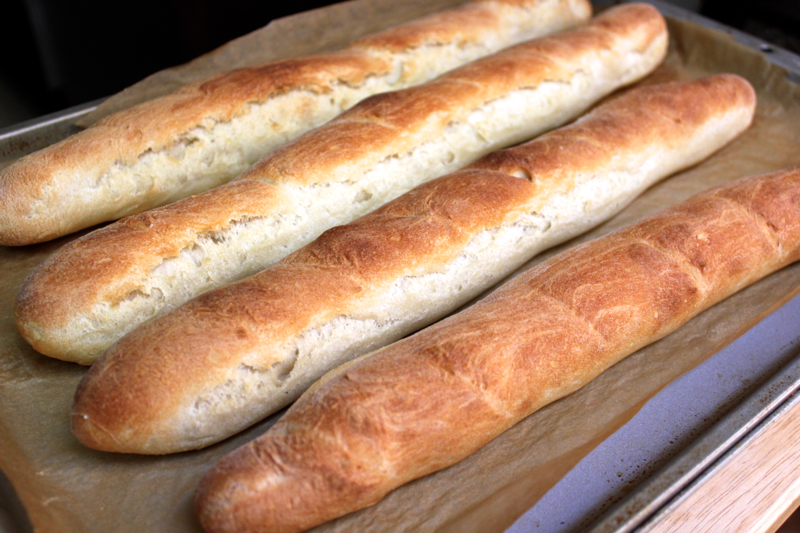 The steam helps the baguettes form a nice crust. 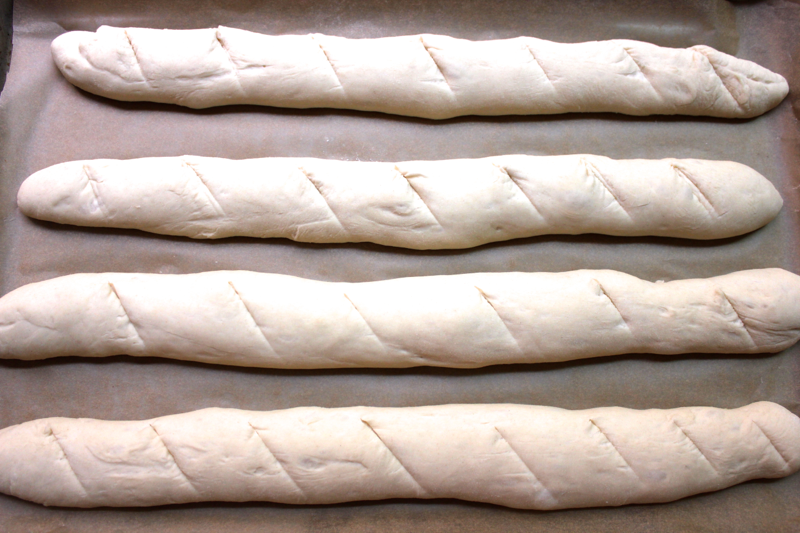 After the third misting session, reduce the oven’s temperature to 450º F, and bake the baguettes for 10 minutes. After that time is up, rotate the pan, and bake the baguettes for another 5-10 minutes until they are golden brown (or the internal temperature of the baguettes is 205º F). Once the baguettes are cool enough to handle, feel free to gnaw into that crunchy, crusty end and pretend you’re walking the streets of Paris. Oh la la! How about giving Stella more than crumbs. It looks delicious.